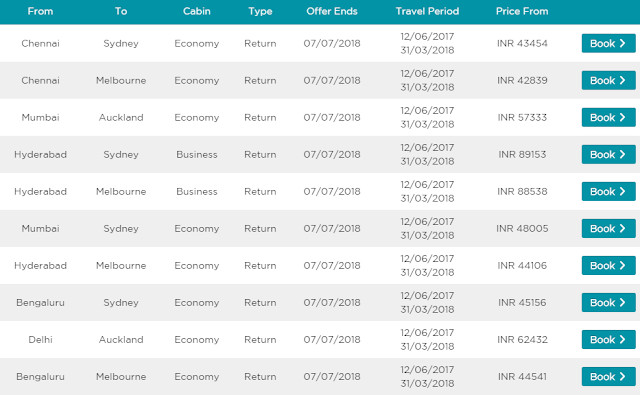 Home / asia / deals / destinations / malaysia / Malaysia Airline India-Australia 45k deal-worth considering? Malaysia Airline India-Australia 45k deal-worth considering? Below is what they've advertised on their website. It says offer ends on 07/07/2018 which is odd because travel period is upto 31 March 2018 only. My guess is they meant offer ends on 7th July 2017. If your sole purpose is reaching Australia on lowest cost, 45k is not cheap. The cheapest I've seen is 20-22k during Air Asia sales. Even Tiger Air/Scoot has tickets around 25k during their sale. But these are low cost airlines that charge extra for baggage, food etc. Assuming you buy baggage and food as well, total spend will be around 32-35k approx, on low cost airline. Malaysian is a full service airline, so may be another 10k is worth it you may think. But before you consider Malaysian, you should ideally check the prices of its main rival- Singapore Airlines. SQ offers better reliability and service, Changi Airport is more fun to spend time at. If the price difference is negligible, I would suggest go with SQ. At this moment SQ is not running any sale, so their price is 10-20k more than Malaysian. Further, I checked if the fares are really same as what's advertised. For some date combinations I could find it close what was advertised. Like below. If you're thinking New Zealand, Air Asia has a 2 stop connection- you will need Australia transit visa- more time and money. Malaysian offers 1 stop flight, so might be more worthy overall. Besides, Malaysian airline has its own set of drawbacks. Last year a friend returning from Bali was subjected to poor treatment because of a delayed flight and missed connections. Use your discretion. This deal I term as reasonable/decent but not super cheap/super exciting. In other words, I wouldn't say "leave everything and check this sale now", rather "just check, if everything falls in place and suits your convenience then only book"
If you are not particular about full service airline, wait for next Air Asia/TigerAir/Scoot sale. You might be able to book it at around Rs 25000 + another 10k probably for baggage and food, still lot cheaper than Malaysian. If Singapore Airlines or Cathay is expensive but only by a small margin, book them. Best wishes and happy journey.